The Magento 2 default order number needs a lot of customization for your specific business, doesn't it? However, you cannot change the format if you don't know code, right ? That's why we made this extension. To describe in three words: change order number. You can improve sales management, customer management, and data security. Customize the order number to the max! Discover additional terms by scrolling down. » Starting counter number: the system will count the order quantity from this number. For example, if you set this as 100, the first order will be numbered as 100 even if it’s the first one. The first order after the counting system reset will be numbered as the starting counter number set above. You can have totally different order number formats for different store views. Our extension supports this demand evenly. Let's see what you can gain with our extension! You should create the order number format smartly to reduce the workload. Because finding or sorting printed invoices is unavoidable. The number format should contain basic information such as the store view, store ID, date of purchase, or any group of letters that meets the specific requirements of each enterprise. Keep in your head that the paperwork actually does not create any additional value for the enterprise. So waste the least time on it! Make the order number to be an influential essence in customer convenience. Include easy-to-remember info such as store’s name, date of purchase, etc… to help your customers easily search the sales documents out when you need to find them. This small adjustment to your management system could bring a high return on customer service quality. Be smart and understand your customers! Your number of sales actually can be estimated from the order number. Magento 2 Custom Order Number basically allows you to modify your sales number by setting the starting counter number and the counter increment step. This will enable you to fully have control over one of the most important data. Depend on the requirements within the management or supply chain system, you can decide to fill which info in the number form with letters. Also, the number of counter padding helps you to meet the local invoice numbering requirements, such as the number of digits, etc. When one website has various store views, that is, the orders from each store view have certain separations. Custom order number extension provides you a freedom to “mark” orders from different store views in specific ways. 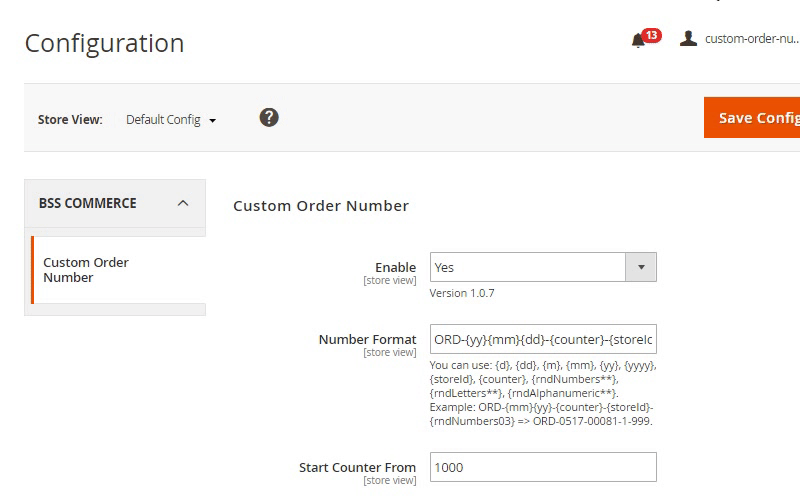 If you don't like Magento default order number, this module is a great idea to change it! I can manage sale documents easily from the backend, which helps me reduce lots of workloads thanks to Custom order number extension! Although I had some small issues configuring it to meet my demand, your support team spent time instructing me to use more easily. I highly appreciate your support! It is really an excellent extension! This is an excellent extension that works well. It has good flexibility and works without error. Good module at a cheap price. All the features work well as described. Great product! I can easily modify the default order number as I want, also with invoice, shipment and credit memo number. With the specific sales numbers, I can manage my store document easily. Additionally, the support team is so professional and kindly. I have just started my business with a Magento 2 website and I really want to build the truth with customers. My products are all qualified but this is not enough to make buyer believe when shopping in my store. By installing this extension and some easy configuration, the impressed number of orders helps me very much in growing my business.